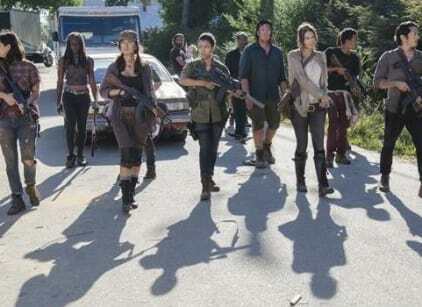 Rick and the survivors enter Alexandria. They meet Deanna who interviews each one. She plans to set them up with jobs in the new community. While everyone is given a place to live, they stick together, still not trusting the place. Rick shaves his beard and meets Jessie, though she has a husband. Glenn, Noah and Tara go out on a run with Aiden and Nicholas, but nearly get killed trying to tie up a walker. Aides gets into a fight with Glenn, but Deanna lets everyone know that Rick’s group is a part of the community as equals. She asks him and Michonne to be constables. Daryl refuses to play along. Carl meets some new kids, including a girl named Enid who disappears to the outside world. Rick agrees to his new role but lets Carol and Daryl know that they will make the place work and if the people can’t make it, they will take over the place.